Can Anybody Tell Me What’s Going On Here? In my last blog, I wrote about two of my games as black in Navalmoral where I changed my standard opening choices at the board without full preparation. In this one, I’d like to focus on my lone loss of the trip, to GM Sergey Fedorchuk. Fedorchuk was the top seed in the event and at 2619 FIDE, even seemed a little underrated. He had been as high as 2671 in April 2008 and was 2655 back in July 2009 before hitting a big cold streak to drop to 2619. This was the evening round of a double-header, so neither of us was probably as rested or prepared as we might have liked to be, but such was the schedule for the event. As it was, there wasn’t really enough time to prepare anything new, but I did have some time to look at some of his games and figure out what I wanted to do. I ended up choosing the Graf Variation of the Ruy Lopez, not the most solid line, but it’s the line I have played the most within the main line Ruy Lopez. Given the fact that I didn’t have much time to prepare, it seemed best to go with what I knew the best. I didn’t really understand the main point behind 14.Qe2 at this point in the game. Before this, White had two standard plans – 14.Nf1, which was normally met with 14…f5, and 14.b4, which was normally met with 14…cxb4 15.cxb4 Nac4. In both cases, Black’s results were fine. I played 14…f5 after a few minutes of thought, and he replied with 15.b4. If I continue along the standard path with 15…cxb4 16.cxb4 Nac4 17.Nxc4 Nxc4, I thought that 14.Qe2 was a high-class waiting move, as now he can try something like 18.a4 Bd7 19.axb5 axb5 20.Rxa8 Qxa8, and given that the e6-square has been weakened by …f7-f5, he can choose from 21.exf5 gxf5 22.Ng5 or 21.Ng5. That was sort of along the right paths – while the rather direct plans I looked at with Ng5 don’t seem so dangerous now, he can instead play 18.a4 Bd7 19.Bh6 Rf7 20.exf5 with a small advantage. Compared to the normal situation without Qe2/…f5 included, Black’s kingside is a bit weaker and his pieces will be stretched a little thin covering both the queenside and kingside. However, in the normal lines with 14.b4 (instead of 14.Qe2), I knew that there was also a rare idea with 14…Nb7. Black’s idea there is to play …a5 and force White to capture on c5 or a5 at some point, thereby freeing the knight back up for active duty. Thus, when I played 14…f5, I planned 15.b4 Nb7, but now he played 16.a4!, and I began to understand the main point behind 14.Qe2. It’s not common for White to want to give up his bishop for a knight in the Lopez (as he would do after 16…Nxa4 17.Bxa4 bxa4) but then, after 18.Rxa4, Black’s got a real problem. His knight on b7 has no active prospects and the a6-pawn is difficult to defend. 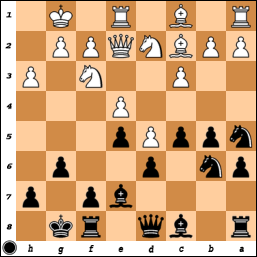 If Black then plays …a5, White steps past with b4-b5, getting a past pawn and leaving the Nb7 to its fate. Black can exchange on b4 before playing …a5, but then White uses the Queen on e2 to good effect. He will exchange once (or twice if Black recaptures with his bishop) on f5 and then play Nf3-d4! If Black leaves the knight on d4, then the e6- and c6-squares are extremely nice for the knight, while if Black takes the knight, White takes the bishop on e7. 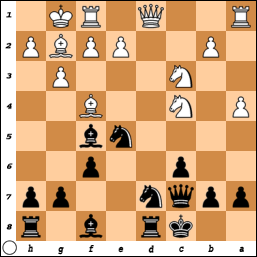 Black is left with weak, doubled d-pawns and bad knights. I’m not sure how much staying power 14.Qe2 will have once people understand what it’s about, but it’s a pretty subtle idea and it was quite annoying to face over the board. He was disappointed that this was all he got from the opening, as he thought his 16.a4 idea was good enough for a clear advantage. Here, though, it’s not clear at all what’s going on. White has a rook and pawn for 2 knights, but Black’s kingside is a bit exposed and his minor pieces aren’t so well coordinated. 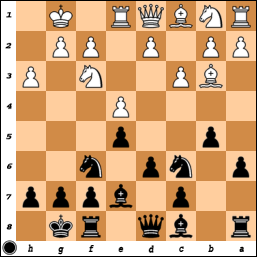 If Black’s king was safe or his minor pieces were working well together, then Black would definitely be better here. I had 11 minute left before this move (no second time control, but a 30-second increment), and I spent over 9 of them trying to decide what to do here. In the end, I played 28…Bg5!?! ?, which really threw him for a loop. I had spent most of my time on 28…Nc4-e5, but maybe it was the fatigue or something else, but I didn’t do a very good job of calculating here. The knight retreat is the most desirable move, since it improves my kingside defenses and coordination, but I was worried about 29.Rxf6 Qxf6 30.Qxe5 Qxe5 31.Rxe5, when I wasn’t sure what was going on. I looked at 31…Rc2 32.Re7! Rxa2? 33.Rg7+!, when Black either gets mated after 33…Kh8 34.Rxd7 and 35.Rd8 or ends up down a piece after 33…Kf8 34.Rxd7+ and 35.Rxd6. I didn’t seem to appreciate 32…Bb5!, though, after which White has to find the very tricky 33.Rg7+ Kh8 34.Bd3!, with the idea of 34…Bxd3 35.Rd7, threatening the knight and mate on d8. He did see this idea, but as it turns out, the simple 35…Kg8 avoids the mate and leaves Black with a definite advantage in the endgame. He missed 35…Kg8 as well, for what’s it worth. Having missed this sequence, though, I played 28…Bg5 to force a resolution to the kingside tension. If he takes on g5, then …Qxg5 will lift the bind on my king, while after 29.Rf8+ Qxf8 30.Bxf8 Kxf8, I thought my 3 minor pieces would be able to hold his queen off. I banked on there not being so much of an attack now, as White has no entry on the e-file and without his dark-squared bishop, he can’t use the weak kingside squares as well. White has shed one pawn but activated his queen and bishop. Black’s clump of minor pieces look nice, but the bishop on e5 is under attack and if it moves, White’s rook invades on e7. Thus, I played 37…Re8, thinking that on 38.f4, I’d get a chance to play …Bd4+ at some point, breaking the pin and grabbing the rook on e1. Unfortunately, I forgot that …Bd4 check is always met with Qxd4 check! After 38.f4 Be6 39.Qd2 Bxa2 40.fxe5! Nxe5, White had a choice. At this point, we were both down to playing on the increment (I generally fluctuated between having 35 and 45 seconds after making my moves and getting the 30-second bonus, while he was a bit closer to a minute), so we didn’t have much time to make our decisions. As it turns out, 41.Kh1 is now the best move, but it’s not an easy move to come up with in time pressure. He chose the more natural 41.Rxe5 Rxe5, and again had a big choice – take the knight on d6 or the bishop on a2? After the game, the post-mortem, and a brief look on my own, I’m still not sure what the correct decision is or what the correct result is in either case! In the post-mortem, we were joined by GMs Korneev and Shchekachev. Both of them thought the endgame was a draw in either case, but that leaving me with the bishop was a much simpler draw for Black. I was not sure what was going on, but I figured I would have better drawing chances with the bishop than with the knight. Fedorchuk wasn’t completely sure, but he was strongly leaning towards a win if he had left me with the bishop, but possibly a draw if he took the knight! He had 30 seconds to decide, and in the end, he took the bishop, leaving me with a rook, knight, and pawn against his queen. After 42.Qxa2, I played 42…Nf7, hoping for 43.Qxa4 Re6, when I think Black might have a fortress of sorts. If White exchanges the b-pawn for the a-pawn, I’m pretty sure it’s a draw. 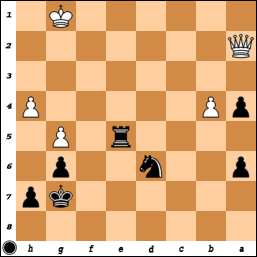 But if he doesn’t exchange, Black’s rook goes to d6, and then he just shuffles with his king, as everything is protected. White’s king can’t enter Black’s position, so I’m not sure how White can win. Instead of this, he played 43.Qc4!, which was a very strong move and a nasty shock. Now I didn’t know how to try and set up a fortress. I played 43…Rb5, guarding the pawn, but after 44.Kf2, he walked his king over to the b4-pawn, and then went after my a6-pawn with his queen. Eventually he broke down the defenses and pushed his b-pawn through. Instead of 43…Rb5, I now think that maybe Black can draw with 43…a5!. After 44.b5, Black now plays 44…a3 45.b6 Re1+ 46.Kf2 Rb1, getting behind the b-pawn. White’s queen can help the pawn advance, but then Black’s a-pawn will cause serious trouble. But if White goes back to get the a-pawn, then the b-pawn will fall. Thus, I think that it’s a draw, but this isn’t the most intuitive way to do it – Black takes his rook away from the safety of his pawns or knight and hangs on by a thread. Still, I’m not very sure about this endgame, or the one with the R+B vs Q. While Korneev and Shchekachev were certain it was a draw, they were unable to prove it to us in the 20-minutes or so that we spent on it in the post-mortem. White always had a series of tricky checks to make small inroads into Black’s position. I finished up my tournament in Navalmoral de la Mata a few days back and am now back in the States. I ended up in clear 3rd place with 7.0/9, a 2632 performance by standard GM norm calculations (the only reason to do this is because in the first round, I played a 1777-rated player). Unlike pretty much every other event I’ve played in Europe, this was a 2-game-a-day affair. In the US, such compressed schedules are pretty common. I have a feeling that for many of the European players at this event, the schedule was pretty tough. I strongly prefer 1-game-a-day events, but I couldn’t find much on the chess calendar that was both strong and soon after Mallorca. GM Sergey Fedorchuk took 1st place on tiebreaks from GM Andrei Shchekachev with 7.5/9. Fedorchuk handed me my only loss of the event in the 3rd round. I had some chances for an advantage in that game, but that was probably the closest he came to having any problems. Shchekachev had a bit of an easier road (Fedorchuk, for example, played on board 1 for the entire event! ), including a forfeit win in the last round over GM Namig Guliyev. There was a 15-minute grace period for showing up to the games (not the 1-hour that is customary in the US), so he was forfeited at 4:15 PM for the 4 PM round. Every other evening game had been at 5 PM, and he showed up at the tournament hall at about 4:55 PM wondering what happened. Unfortunately for him, his game had long since ended. I’ve played a bunch of events in Spain over the past few years, and this was unlike most of those in a few respects. I’ve already mentioned the schedule with 2 games per day, but the composition of the event was also pretty distinct. The top of the tournament was reasonably strong – Fedorchuk and Burmakin headed the field, and Fedorchuk has been as high as 2671 FIDE recently (and he took Shirov to tiebreaks in the ongoing World Cup in the second round). At 2510 FIDE, I was the 11th seed. However, after about the top 15 players (around Berbatov at 2463 FIDE), the next players’ ratings just dropped off a cliff. By the time the seeds were in the mid-20s, they were down to 2280 FIDE or so. In a 90-player field, that essentially meant there wasn’t much of a middle in this tournament. There were the guys at the top … and then the guys well below them. As a result, I had a few rounds where there were some definite mismatches and so rather than go round-by-round, I’ll group the games a little differently. These two games were strongly characterized, I thought, by the fact I changed my normal opening patterns at the board – they weren’t completely new to me, but I certainly hadn’t prepared these lines for those games. However, I smelled a bit of a rat in both instances and so I decided to change my normal play call and in both cases, it worked out quite well for me. 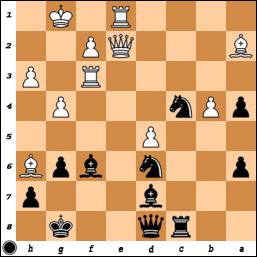 In the second round, I was black against Benjamin Garcia Romero (2233 FIDE). I had played him back in 2007 in Benasque, and in that game, he played 1.d4 and I responded with a Benoni. I ended up outplaying him early on in the endgame to win a pawn, but then made a number of mistakes and almost let him escape with a draw before finally putting him away. When I was preparing for this game, I noticed that with the white pieces in the database games, he performed almost at a 2400 clip, but that as black, he was performing like a 1900! Pretty shocking differential. I had been expecting 1.d4 again, so 1.e4 was already a surprise. Now that he wanted to play a main-line Lopez, I had to decided what line to choose. The Graf (with 9…Na5 10.Bc2 c5 11.d4 Nd7) has been my most common choice, but I immediately tossed that out because there are a bunch of forced drawing variations in the main line. The Karpov (with 9…Nd7) was a serious choice, but I had seen that he had played it himself as black, and so I thought he might know the theory there and steer things to one of the quieter, pretty equal lines. 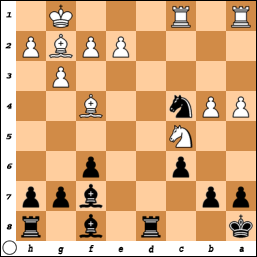 Thus, I settled on the Zaitsev, with the …Qd7 line in case he wanted to repeat with Nf3-g5-f3. After 9…Bb7 10.d4 Re8, he immediately played 11.Ng5 Rf8 12.Nf3, waiting to see what I’d do. Not wanting a draw, I played 12…Qd7 13.Nbd2 Rae8! ?, an extremely rare sideline. In about 235,000 games with the Ruy Lopez that I have in my database, this position has only been reached 14 times! It’s not Black’s “best” line, for sure, but it is somewhat tricky and most importantly, it avoids the repetition. It worked like a charm as instead of the most common 14.Nf1, he immediately went wrong with 14.a4. This is a normal Lopez move, and it seems even more obvious here, as Black’s deserted his queenside with …Rae8, but White runs into some problems with his e4-pawn and d3-square here. I responded with 14…exd4! 15.axb5 axb5. If now 16.cxd4, then 16…Nb4! is quite annoying – the d3-square is weak and the Nd2 is stuck to the defense of the e4-pawn. He doesn’t want to give up his bishop with Bc2 (or allow …Nd3xc1), but 17.Re3 c5! already favors Black. He has all his pieces in the game and some annoying threats. He played 16.Nxd4 instead, but White’s big pawn center is gone, and after 16…Ne5 17.Qe2 c6 18.Bc2 Bd8, Black’s setup was starting to make sense. With …Bb6 later, pretty much all of Black’s pieces are again working well. When White moves his knight from d2, I was ready with …c5, effectively exchanging the b5-pawn for the e4-pawn and activating my light-squared bishop. White never really got into the game. In round 8, I was black against the young Spanish IM Alvar Alonso Rosell (2507 FIDE). I had decided to play the solid Slav Defense against him, but in the main line after 1.d4 d5 2.c4 c6 3.Nf3 Nf6 4.Nc3 dxc4 5.a4 Bf5, I was expecting only 6.e3 (the only move he had played in previous games). However, at the board, he dashed out the currently more popular 6.Ne5 and I began debating what to do. Does this look familiar? At least for me, it was! I had the same position with colors reversed in the last round of Mallorca against GM Savchenko (covered here). In that game, I played 6.Ne5, having prepared some stuff against the Sokolov Slav, but he surprised me with this line. I was impressed enough with it to repeat it here. Rosell sunk into a deep think, which made me happy at least that I had gotten him out of any opening prep and on his own. He continued with 13.Nxe5 (I played 13.Qc1, but that didn’t lead anywhere) Nxe5 14.Qb3. I responded with 14…Qf7, since with the queens on the board, White’s attack will be quite dangerous. After the queen exchange and some maneuvers, we reached the following position where I just got out of check with 21…Ka8. I thought I was ok now, as I didn’t see any way for White to continue with his attack. If he could play b4-b5, opening the long diagonal for his bishop on g2 that’d be on thing, but here the knight on c5 is always hanging. If the knight stays on c5, Black is also planning …a5 to undermine it and give his king added luft. If the knight retreats, say to d3, then b5 decreases in strength because b7 won’t be attacked. After 22.Nd3, I was planning 22…g5!, taking his dark-squared bishop away from him. 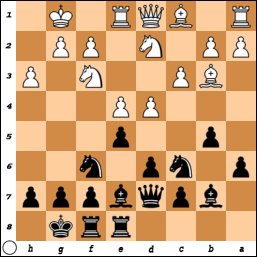 Then Black’s king can hide back on b8. He played 22.Na6! 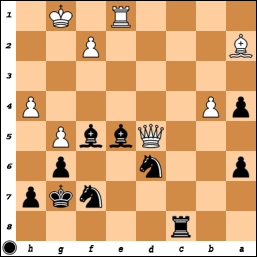 here: I had seen this: the knight can’t be taken because of 22…bxa6 23.Bxc6 mate, but I had planned the simple 22…Bd6. I thought I was fine here because the knight is now indeed threatened and going forward with 23.Nc7+ Kb8 doesn’t make any sense. However, he now really uncorked a surprise on me with 23.b5! !, which he played with only one minute on his clock! There was a 30-second increment, so he wasn’t going to lose on time, but he was certainly in time pressure. The knight is taboo: 23…bxa6 24.bxc6 (threatening a discovered check and mate on c7) Kb8 25.Rab1+ Kc8 (25…Kc7 26.Rb7+ is crushing) 26.Bh3+! (a sneaky little check from the other side of the board) Kc7 27.Rb7+ Kxc6 28.Rxf7 is winning. I had to play 23…cxb5, but now my king is stuck in the corner and his bishop on g2 is finally breathing fire. Here, though, he messed up with 24.axb5. After 24…Bxf4 25.gxf4 Rc8! (covering the c5-square), I was ok. I had …Rhd8 and …Bd5 to break the pin on the b-pawn, after which the knight is forced back and my king can go back to b8. Instead of 24.axb5, he should have played 24.Bxd6! Rxd6 25.Nc5!, which would have guaranteed the win of the b7-pawn and a continuing initiative. The game continuation, though, let me off, and in time pressure, he made the mistake of trying to press on when he should have taken his foot off the gas and played for a draw. That led him to pitch a pawn in the hope of keeping his initiative going, but I took the pawn and slowly turned his pieces back. The pawn-up endgame was then just a matter of technique, and while I certainly took my time with it, the result was never in doubt.